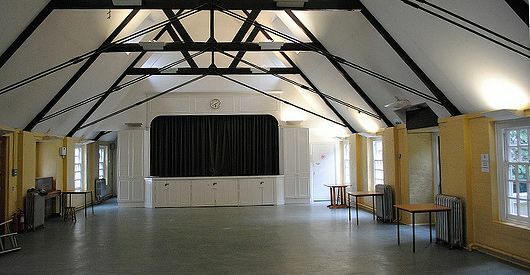 We have two large halls and one small 'hut' which are available for hire. However, during term time schools use the premises during the day. In the evenings the halls are hired out for group meetings including scouts and brownies, AA and yoga. All of our premises are available for hire during school holidays and at weekends from 8am to 10pm. Our most popular days are Saturday and Sunday afternoon, for events like children's parties, for which we ask for a minimum of three hours. A deposit of £100 is required in case extra cleaning is required if the premises are not left tidy and clean. We do not book evening parties because the halls are in a residential area and there are noise restrictions. Contact the office for further information about booking and any questions. Follow the links for photographs and more details.